Setting up a proxy server when browsing is required by a lot of users as a feature. And Microsoft’s new Edge browser, allows you to do so. 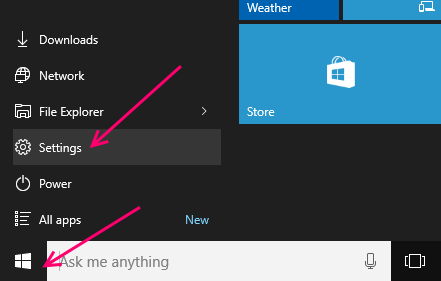 If you do not know what a proxy server is or are wonder about its uses, i suggest you google for more information and then follow this article to learn how to setup a proxy server in Windows 10 on the Edge browser. A proxy server in general is a computer that functions as a gateway between a web browser and other internet servers/ proxy servers. Proxy servers help improve performance by storing local caches of web pages and other sites and using it later for better performance. When a browser connected to the proxy server, requests a webpage that is already stored in the proxy server, it will be provided by the proxy server instead of requesting a fresh copy from the network. This is faster and helps contain the spread of malicious content and files on different Pc’s connected to the network. A proxy server in Edge, can be setup manually or can be set to automatically scan for proxy server settings, detect and use them. 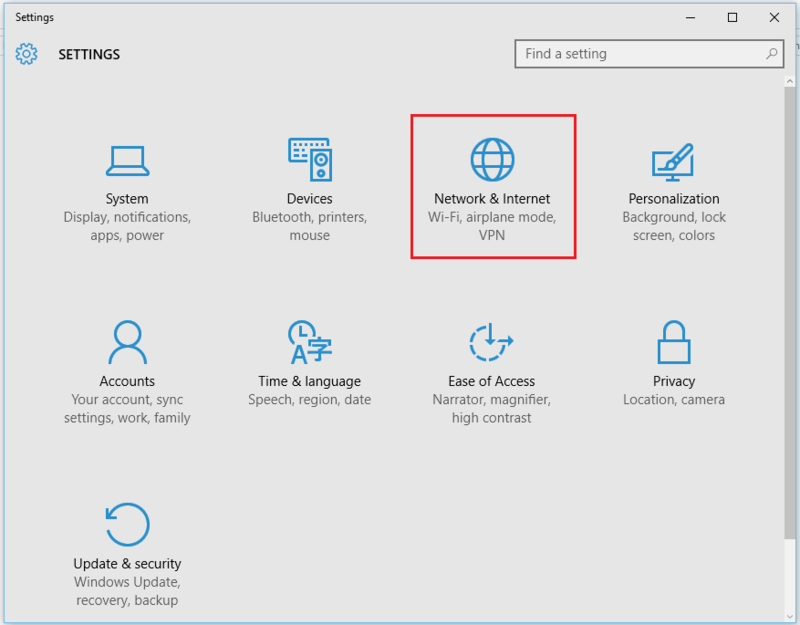 Note: Edge will only be able to detect automatic settings for Wifi or Ethernet connection and will not support VPN connections. Make sure you have a working internet connection and no background tasks running that can interfere with the program. 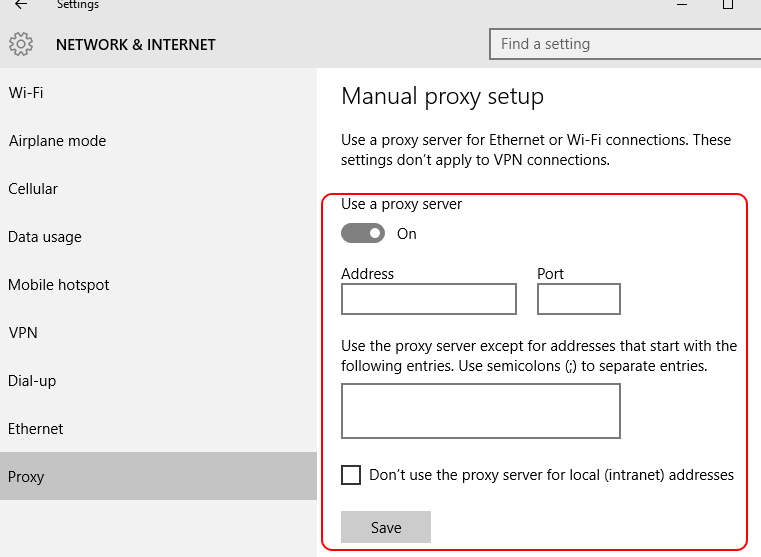 Here are the steps you need to follow in order to setup a proxy server in Edge. 5- Click on the windows start key and then settings. 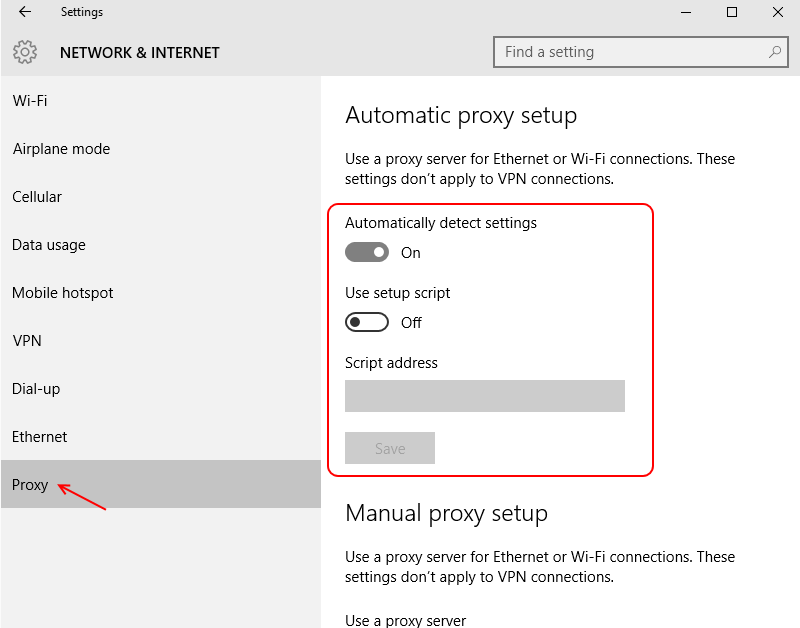 6- You will find the Proxy option highlighted under Network and Internet Settings bar, select it. 7- The proxy pane is divided into Manual Proxy Setup and Automatic Proxy Setup. 9- Toggle the slider under the option that says Use Setup Script. This will enable the Edge browser to use the setup script if the address of the server is known. 10- In the box that says script address, input the Script’s address/ path and simply click on the box thats says save. 11- Now we move on to Manual Proxy Settings. If you know the Ip address and the port of the server, toggle the slider under the option that says Use a proxy server to On. 12- Enter the Ip address in the box that says address and enter the Port address where the box says Port. 13- Click on Save to save your settings.